This generously-timed boxed set brings together, for a very reasonable price, some of Berlin Classics' old recordings of favourite symphonies and a few works that are outside the charmed circle. The low cost comes with a caveat, in that there is no booklet - just five card sleeves in a glossy clamshell, with basic information printed straight onto the card. Indeed, this is part of Berlin's 'Basics' range: 'standards in excellent performances at an unexpectedly low price'. The quality of the featured symphonies is a given, as are the star ratings of orchestra and conductor alike, the latter mainly of a certain vintage - though Masur, Flor and Blomstedt are still very much alive. All are in action with orchestras they achieved a well-deserved reputation with, and most have or had a special place in their hearts or minds for the Romantic works performed here. The only odd inclusion is Mendelssohn's G minor Symphony for strings - there is more than a suspicion that it was the first thing Berlin Classics found that would fit onto the same disc as Bruckner's massive Fourth Symphony. Elsewhere there is a sense that some of these pairings have been decided on timing alone, but it would be churlish to take that too much into account, for these are reliably decent recordings that make a thrilling introduction to the symphony as art form. 'Thrilling' is certainly a word to describe Heinz Rögner's Bruckner, incidentally - probably the fastest version ever recorded, certainly in the Symphony's original 1874 form - a whole quarter of an hour quicker than more reflective readings. On the other hand, audio quality is not uniformly impressive. 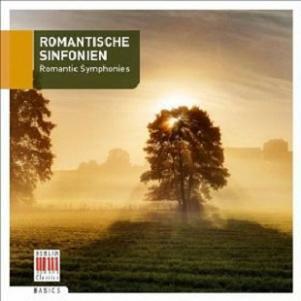 The digitally re-mastered ADD recordings come mainly from the 1980s, with a couple from the Seventies and the Schumann and Franck from the Sixties. The trouble with Eighties recordings in general is that digital technology was never much to write home about, with flatness and tinniness typical concomitants. Such is often the case here: only the high-speed Bruckner, the well-preserved Tchaikovsky and the excellent Saint-Saëns/Dvořák disc are really good enough for even the most moderate of audiophiles. For newcomers, though, there are worse places to start a collection.